My completed knitting projects are few and far between but here are a couple of things I have completed recently. The ruffle scarf is a year-end gift for my son's Grade 1 teacher and I just finished it today. That's a good thing because there is only one week left of school! I used "Starbella" yarn for this project. 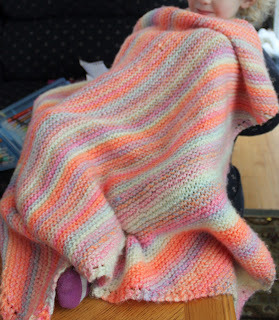 The sunset coloured blanket was finished in May. It took me a year to get it done because I kept putting it down and working on quilts. It is a basic dish cloth pattern only made gigantic for a blanket. My little girl was so kind to model both projects for me. I have a dish cloth that is near completion and has only been in the works for about a month but I have yarn for several more dish cloths and they are needed in my sink. I must try to knit faster. Two more quilts are on the go too including the second "Lorax" quilt for my son's room. There are so many fun projects to keep busy with this summer.